When going to sleep everything around you matters – how bright or dim the room is, how you feel as you go to sleep, and even what you are smelling around you. Certain scents can determine how easy it is for you to go to sleep, and they can even determine how you feel in the morning. If you smell something that helps you go to sleep at night, then it is possible for you to wake up even more refreshed than ever. Here are 4 calming scents that can help ensure a good night’s rest. This plant, consisting of many purple flowers, has been proven to not only help you fall asleep faster, but it will also help you sleep more soundly, and you will wake up feeling well rested and refreshed. Lavender is one of the most popular scents in traditional aroma therapies. This purple flower tends to be most effective on young people, women, and those suffering from mild insomnia. These flowers are described as being similar to the common daisy. The German and Roman variety of this apple smelling plant are commonly found in teas, dried sachets, and essential oils. Chamomile is well known for its ability to help the relaxation of one’s mind and body as well as ease tension. If it’s not enough that this wonderful flower is a sleep aid, it is actually recommended when someone wants to ease the emotional symptoms of PMS and menopause. You can either inhale the scent while drinking a cup of chamomile tea at least 30 minutes before bed time, or you can place a few drops of essential oil in a diffuser in your room in order to get the best effects of this relaxation inducing plant. These fragile flowers seem to be more famous for their aphrodisiac properties than anything else. However, just the scent has proven not only to reduce stress and anxiety, but, as well, to have a sedative effect. It has even been used as a natural treatment for depression. Jasmine helps the body enter into a deeper sleep and, interestingly, even helps one stay alert throughout the next day. Most often recognized for its ability to add flavor in the kitchen, this sweet smelling flower also acts as an antidepressant and has definite tranquilizing abilities. Most common tranquilizing effects include lowering of blood pressure as well as promoting a feeling of calm and well-being. The easiest way to utilize this when going to sleep is to place a few drops onto a cloth and place it into your pillow case before falling asleep. Sleep depends on all of the five senses. Everything is important to consider especially if you are prone to insomnia or restlessness. Next time insomnia hits your life, try and figure out which one of your senses is keeping you from falling asleep. It could be a tactile sensation, such as purchasing new or freshly cleaned bedding or disposing of pilled up or rough sheets, even a light that is shining through an open blind, perhaps something that you are smelling. 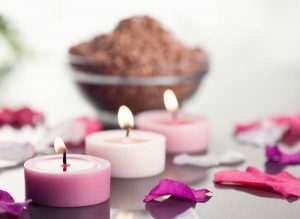 If it is a “brain” thing, such as the inability to shut it down after a particularly hectic or stressful day, then try one the 4 calming scents.